Research confirms there are social, emotional, and academic benefits to having teachers of color for both white students and students of color. Currently, however, a child’s chance of having an African-American or Latino male teacher during his or her K-12 experience is one in 50, a statistic we find unacceptable. 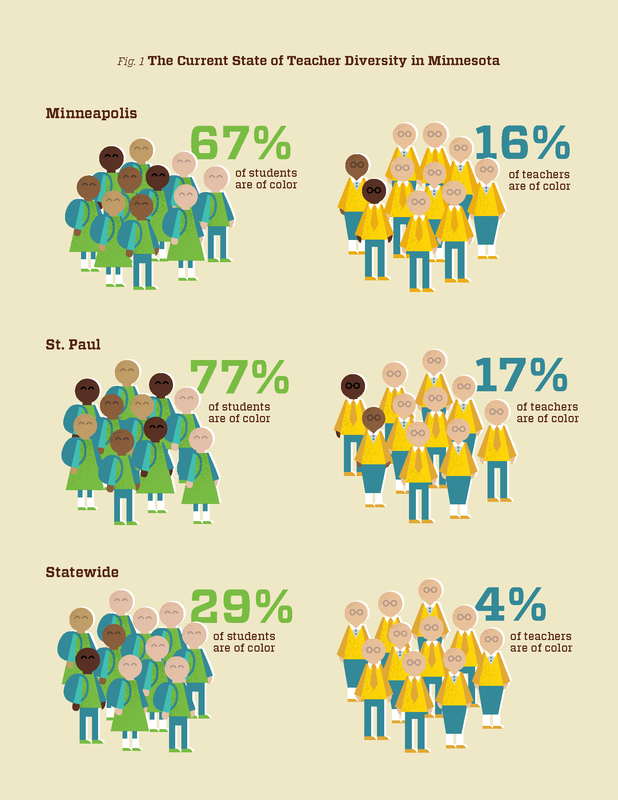 While student populations are increasingly representing diversity, Minnesota’s statewide teaching population is 94 percent white. Ultimately, to reach all of our students, we must ensure Minnesota has a teacher workforce that is representative of our students, culturally competent, and highly effective. The professional pipeline for teachers of color can be strengthened at all stages– from recruitment, induction, and retention. Through action at the state and local level, improved policies can help diversify the teacher workforce and elevate the profession as a whole. Recruit and support prospective teacher candidates of color from high school through college. Publicly report teacher preparation program outcomes with data disaggregated by race. Expand school or community-based teacher preparation pathways. 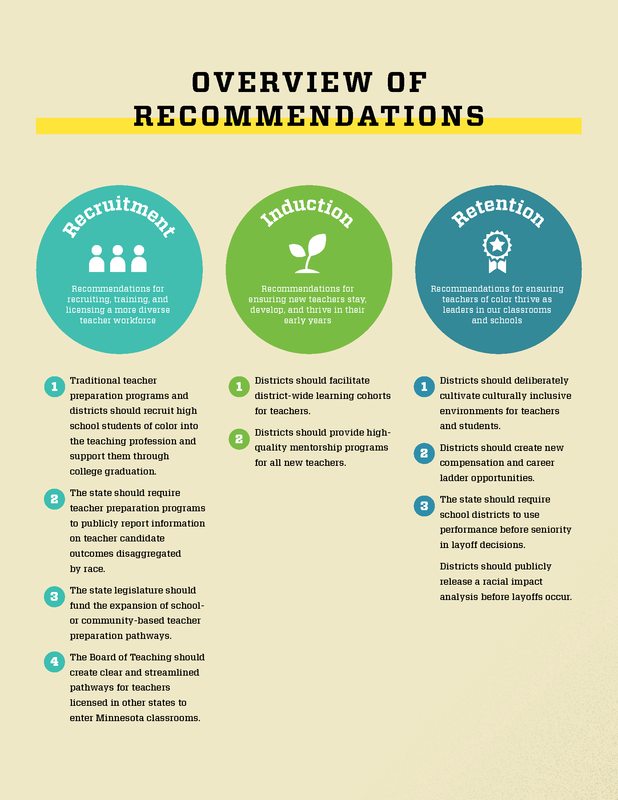 Create clear pathways for teachers licensed in other states to enter Minnesota’s classrooms. Establish content-based teacher cohorts to support teacher growth throughout their first three years. Provide mentorship programs for all new teachers. Cultivate culturally inclusive environments for teachers and students. Create new compensation and career ladder opportunities, and factor performance before seniority in layoff decisions. We are a team of 16 teachers who met over the course of three months to review research on recruitment, induction and retention of teachers of color. We conducted interviews with teacher colleagues, district leaders and other education stakeholders. We also held focus groups, surveyed colleagues and hosted a large-group listening session to gather feedback and ﬁnalize our recommendations. In total, we gathered feedback from more than 200 educators.